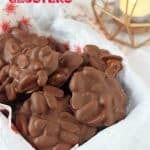 These super easy two ingredient Chocolate Peanut Clusters make the perfect last minute edible gift or snack idea this Christmas! Melt the chocolate in a large bowl or jug (you can do this in the microwave or over a pan of hot water on the hob, just be sure not to let it burn). Once the chocolate has melted stir in the peanuts and mix until they are all coated. Line two trays or plates with parchment paper. Spoon out a dollop of the chocolate peanut mixture onto the parchment and press down with a spoon. Repeat until all the mixture is gone. You should be able to make approximately 25 clusters depending on their size. Refrigerate for 30 minutes until solid. Serve or package them up for gifts. These clusters are best kept in the fridge so that the chocolate does not melt.